Very nice work you have done! I have read your entire thread now and see how resourceful you are and you have indeed solved all of your challenges nicely! Don't you find great satisfaction in finding solutions to work around the limitations? I myself find that it would be less satisfying if I had tons of time and money and could just pick everything I needed from the top shelves. I'm not actually a thrifty person, but I enjoy a good challenge. I also admire your attention to detail and aestetics. I simply don't have the skills nor the patience to make it look so nice. I have a little bit of input for you. Regarding media in your beds, don't be afraid to use coarse gravel. Go way up to 30 - 40 mm size pebbles. Regarding filters - don't sweat it too much! Your media beds will do a great job filtering out solids and have more than enough surface area for you bacteria. Use one drum as a swirl filter to settle out the heaviest and largest bits and thats it. 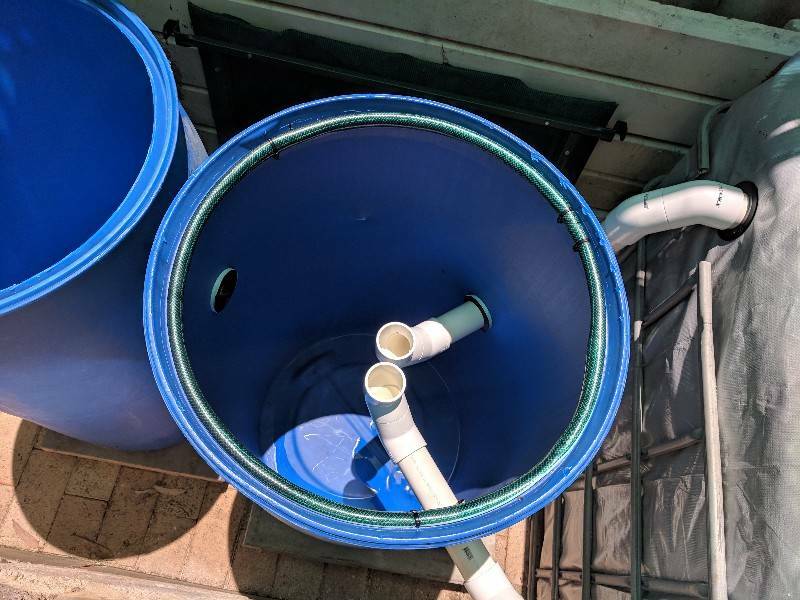 You can stick a hose with a pump into that drum once in a while and pump the solids out and pour them into your garden somewhere. Preferably around a fruit tree! :-) A second drum can be your sump. 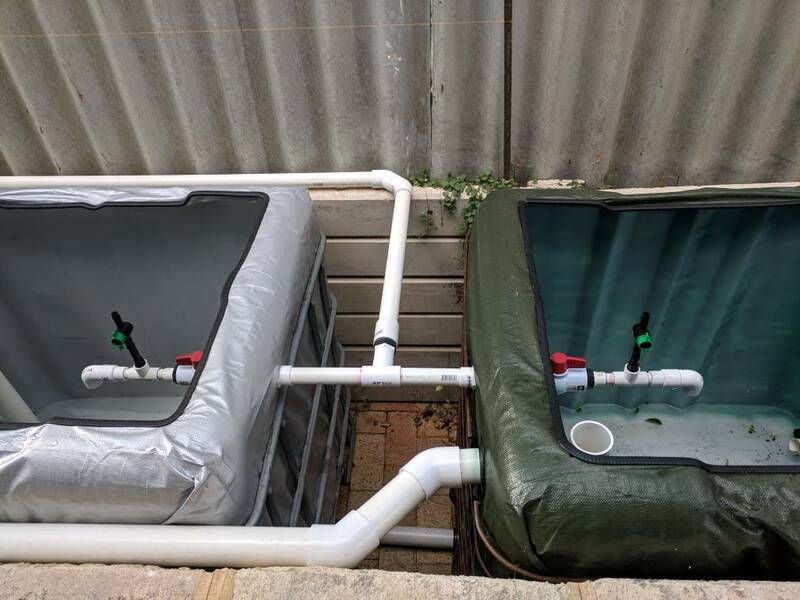 You don't need a mineralisation tank or a media filter as long as you keep a fairly low stocking density. Raising fewer fishes per volume also gives you a safer system which will not crash so easily. I keep around 30 - 35 trout per IBC. I have a settling tank before my sump tank, no filter or media. In the settling tank I keep crayfish (you would have yabbies) who are happy to rummage on the bottom and break up everything into even finer matter. I also take water from the bottom of my settling tank to water flowers on the patio via a pump. I grow the trout from fingerlings. I grow trout because they are native to my area and therefore fit the temperature ranges here. You'll know what suits you best. I see there are others suggesting that you run DWCs instead of media beds. I agree with a mix of both. Whether you should have media beds or DWCs depends on what you want to grow. Things like toms and chukes like the media beds, as do brassicas, peppers, squash etc. All leafy greens as well as cilantro, parsley, mint etc. do really well in the DWCs. Personally I would have 1 media bed and 2 DWCs. Let the water flow into the media bed first and from there into the DWCs. Then back to the fishes. Run it all as constant flow. Many thanks for the feedback. It's good to have some interest and thanks to all those who have spared some advice during my build. What I end up with will be a combination of ideas you have all given me so, in part, it is also yours. I'm sure there will be many more modifications as time passes. Some good tips Jens, I think incorporating at least one DWC will be the way to go. I think I'll stick with the expanded clay though. It's expensive, but worth it. I think it does contribute to the aesthetics in some ways too. 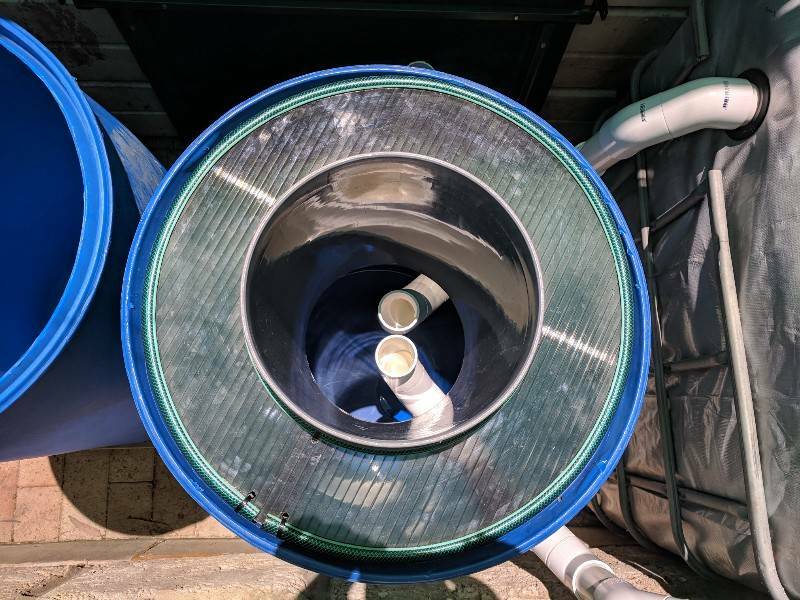 Some good thoughts on filtration as well. I don't want to over complicate the system, but I don't want to under filter as well. I've been trying to do this build as cheaply as possible, but I think at the end I'm not going to get much change out of $3000, but it's been incredibly fun. Although I'm currently on holiday. We have had a French exchange student staying with us the past month, which has kept us very busy. I hope to make more progress from next week. More posts soon. I have one bed of clay pellets. I use it for my root vegetables. I cannot plant anything tall in it. The rest are clay and pea gravel which although are rougher on the hands, taller plants are manageable. I have pm'd regarding clay. The last two beds I'm planning will be blue Metal and a dwc. I've heard the blue metal will add minerals to the water as it ages. Jens just FYI, Toms do incredible in DWC too. I had some that I took cuttings from another plant and stuck them in the DWC just to root them and ended up leaving them in there because they grew huge. I just trellised them up to hold them. In retro the only problem I had with them in the DWC was the roots got huge and I don't have any filtration on my system so when the roots filled the bed it trapped solids in the bed that would have otherwise cycled through the system until they made their way to my media beds. If you can do it then go for it. Clay offers advantage such as wicking and moisture. Most important is to keep your water level down at leas 7-10cm from the surface. Clay balls and roots will do the rest. DWC are certainly an effective way to cost save on media. And a media Gb to DWC works a treat. If you don't want to do polystyrene then there are various other options. Multi-wall/cell acrylic or polycarbonate roofing with baskets works well. I just fill mine with clay balls - don't worry about foam. 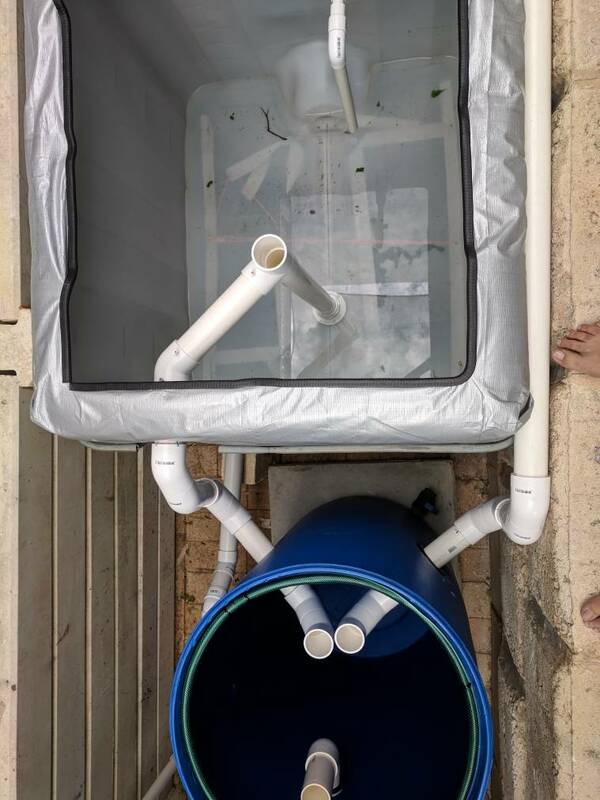 I run my DWC tubs on timers 30-30 with rest of system - doesnt seem to worry the plants. But I also run the 'air gap method' with acrylic cell roofing as the suspended 'raft' and baskets. Yes, with all that rain we had in Perth the other day my GB with the clay was almost filled with water, but around 10cm from top of the media. Since then I've noticed the clay wicks the water to the surface quite well. Only in full sun does it dry out. Surprised to hear you say to keep the water level 7-10cm below the media. I was aiming for about an inch. I would need to adjust my standpipes! 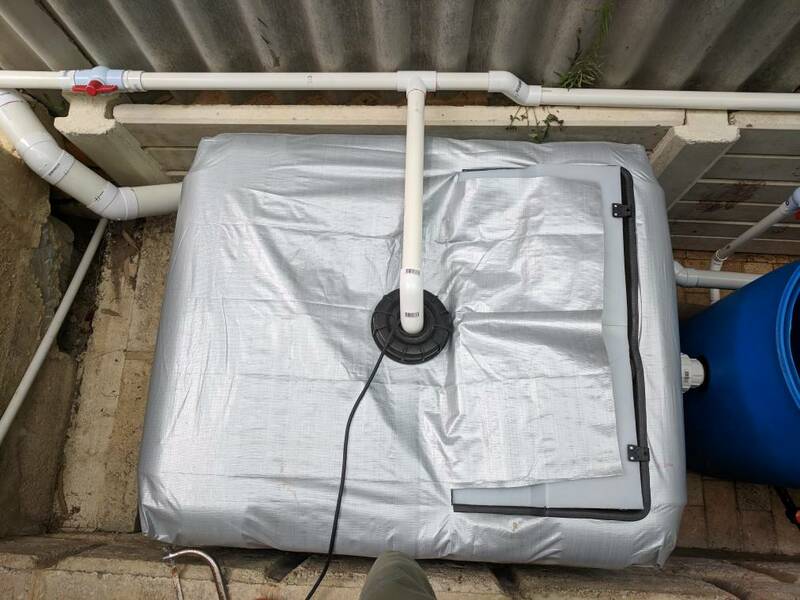 My two fish tanks and the sump IBC have now been covered with tarps and I'm back into plumbing the system. Pics of the RFF below. I have twin standpipes coming up inside. 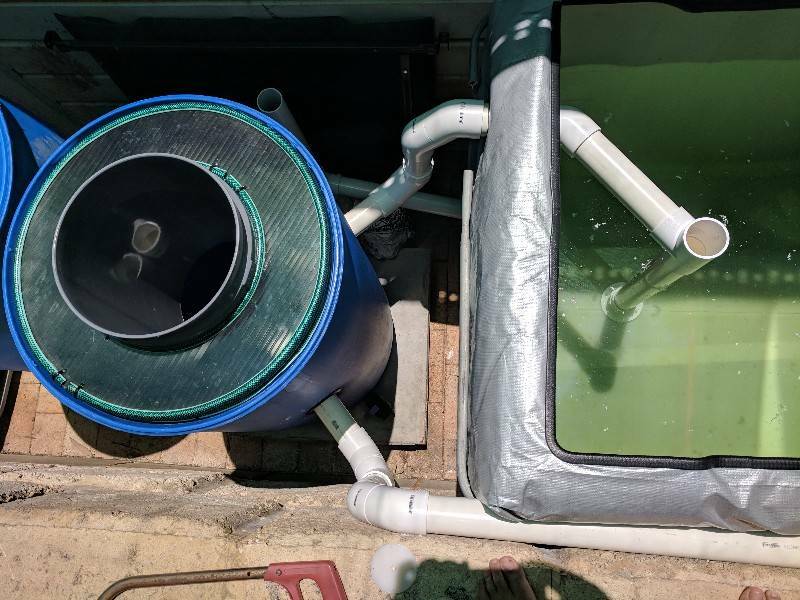 Now working on the biofilters and plumbing the water from the pump side of the system. Very nice work! I'm really looking forward to seeing your system running! Just in case anyone tries to do something similar, don't underestimate the weight of the growbeds. 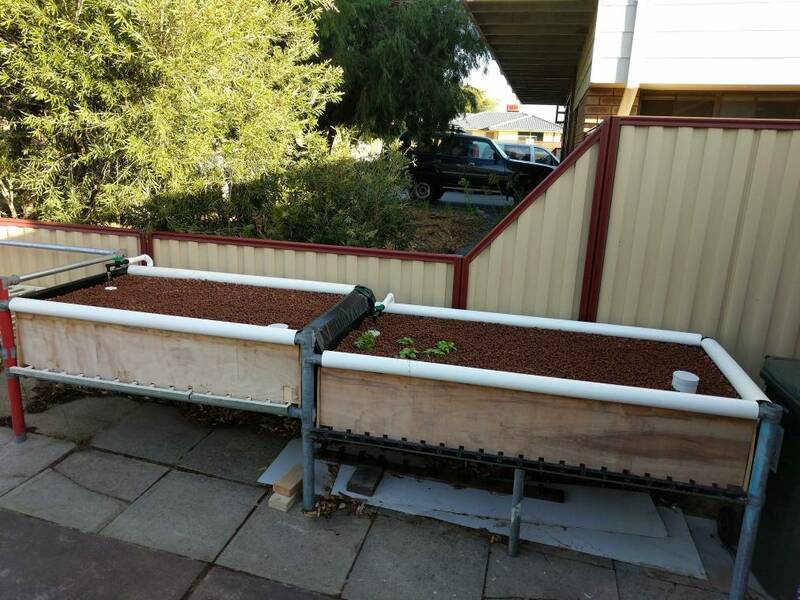 As you can see from the picture below, the bottom of the growbed is sagging a little. I was actually quite surprised by this. The pipe is thick 32NB steel and it felt solid. 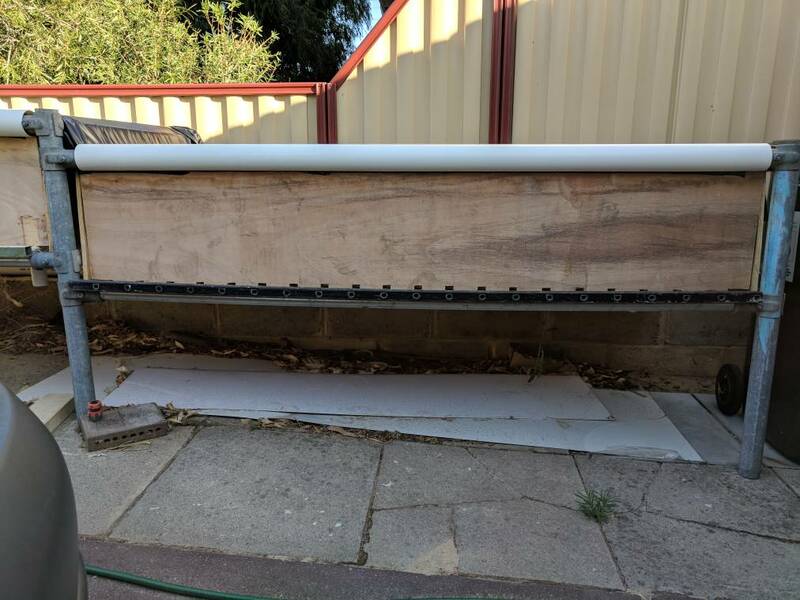 I guess the 2m span is a bit much, plus my GBs are fairly deep. So, I will be jacking it up in the middle and installing some more posts. 2PM 2.2.2018 My system is fully plumbed in!!! I will be turning on the pump (Pondmax EV-7200 85W) for the first time tomorrow. Just one GB hooked up for now. I've started the system. Here is a link to a short video of it up and running this morning. Thanks to everyone who helped make this possible! I'm sure I will need more advice going forward. Hopefully the link works. I'm new to posting on YouTube. Awesome so far. Might use a few of your ideas too. Soon there will be things growing there too! Lookin' good Dr, may I suggest planting some plants and dosing up with some Charlie Carp or Powerfeed? Yep, I've thrown in some herbs and put a little powerfeed in. Not quite sure how much to put in though. I just diluted a few capfulls and sprinkled it around the plants, but I would imagine this would get washed away pretty quick. How much would you recommend, I'm wary about adding too much too quickly. 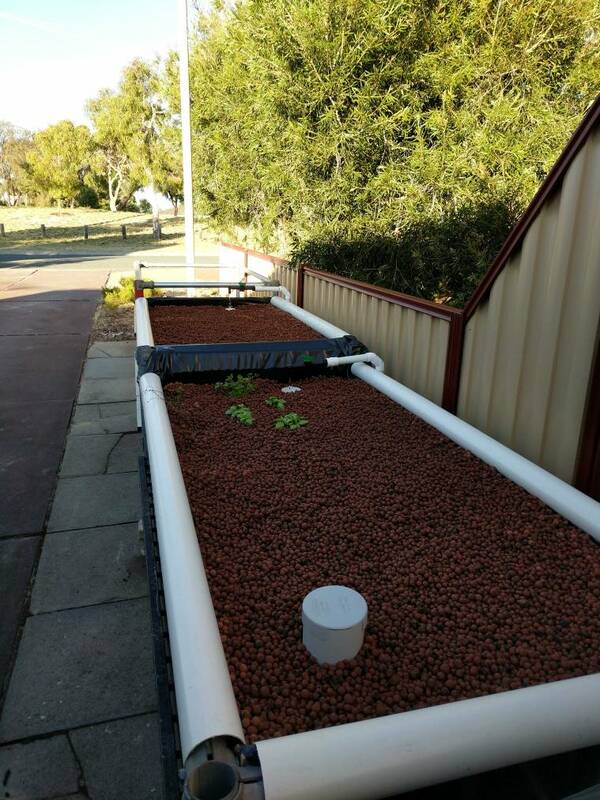 On the recommendation of our local aquaponics store I've even thrown 3 small SPerch in two days ago. They seem pretty active and are feeding. I've also got my second GB up and running. So, lots of room to plant stuff! I've been monitoring my DO and temp, which has been sitting at 8.5 mg/L (ppm) and between 22-24 deg C. I borrowed a nice DO probe from work that cost me about $5000 a few years back. It auto calibrates with a linked temp, humidity and atmospheric pressure sensor. I found adding CCarp was a good indicator of when the system was ready to handle fish in that when I did my API test and saw ammonia how long it took to go through the cycle to nitrates. It got to a point where I could add a good splash of CC and not see anything so I knew I was good to go with the fish. Seeing as you now have fish it's somewhat different and I wouldn't be adding anything except seasol as the system needs to cycle for the fish.